It is fine to not be able to touch your toes! The practice is about allowing yourself to be OK exactly where you are! Through practice, your body will find more space & flexibility. Yoga is about balance and even though you may love a gym workout, the practice of yoga as little as once a week can ENHANCE performance in other sports/trainings by allowing the body to open more naturally. The practice will allow you to feel more engergized, build core strength and flexibility, eliminate lower back pain, reduce stress and clear the mind. Yoga was started by men over 5,000 years ago as a way to prepare the body for mediation. There are so many men that practice yoga today, that yoga studios around the world are offering “men only” classes! Read about it – “Real Men Do Yoga” is a phenomenal book from the male perspective! 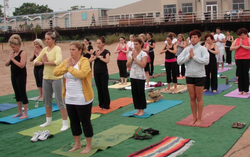 According to the Yoga Alliance, there are over 400 styles of yoga practiced today. 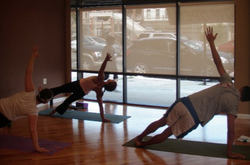 A power vinyasa yoga practice is taught at a faster & dynamic pace and is certainly not boring!!! Yoga is a practice of mindfulness - linking breath and movement to allow space in your life & your physical body. If the practice of yoga is about a belief, it is to encourage the connection between mind & body. There are some yoga philosophies that encourage a certain diet or restrictions on what you eat or drink, but we believe that is a personal choice. We encourage truth, kindness & compassion in all and hold a space without judgment that everyone will lead the life that is right for them.